Yuzvendra Chahal took 2/27 but Royal Challengers Bangalore lost by five wickets to Mumbai Indians in the 2019 Indian Premier League. Royal Challengers Bangalore stumbled to their seventh loss in eight games. Yuzvendra Chahal took 2/27 and was backed up by Moeen Ali's 2/18. Yuzvendra Chahal and Kuldeep Yadav are the two legspinners for the ICC Cricket World Cup 2019. Yuzvendra Chahal and Moeen Ali were the stars for Royal Challengers Bangalore as they looked to revive their IPL 2019 campaign against Mumbai Indians. AB de Villiers blasted 75 and Moeen smashed 50 to boost Virat Kohli’s side to 172/7. In response, Moeen picked 2/18 in four overs while Chahal took 2/27 as Royal Challengers Bangalore put pressure on Rohit Sharma’s side. 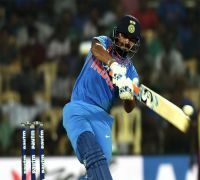 However, Hardik Pandya’s blazing 37 off 16 balls helped Mumbai Indians to a five-wicket win and inflicted Royal Challengers Bangalore their seventh loss in eight games. 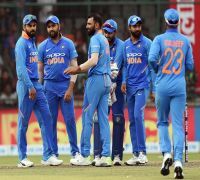 Speaking after the match, Chahal praised Hardik Pandya’s efforts on a pitch which was offering turn but ruled out that no certain individual was to blame for the loss. “The pitch was offering turn and it wasn't easy to score against the spinners. We bowled well till the 18th over (barring a) couple of bad overs in the powerplay and still, there were two overs and 24 runs (actually 22) left (for Mumbai to chase). We had a chance on this track but Hardik did well. You can't blame a particular bowler. A medium pacer or a spinner not bowling good, it is (still) a team game. If we lose the game, I accept that (as a bowler),” Chahal said. However, the day was bitter-sweet for Chahal, who was selected in the 15-man Indian squad for the ICC Cricket World Cup which will begin on May 30 in England. Chahal said he was focused on playing his first World Cup but at the same time, the legspinner did not give up hope for Royal Challengers Bangalore’s playoff chances. “World Cup is after one month and still I'm playing for the RCB, so I'm just looking towards the next seven matches. It is my first World Cup, I'm very excited about that. Everyone wants to represent the country in the World Cup, so I'm excited,” Chahal remarked. Royal Challengers Bangalore will next take on Kolkata Knight Riders at the Eden Gardens on April 19 while Mumbai Indians face a crucial match against Delhi Capitals on Thursday. With this loss, Royal Challengers Bangalore’s playoff prospects are virtually over.